Mobile phones have become the preferred medium of accessing and performing a majority of online services, especially with the exponential growth of feature rich and user friendly mobile apps. These apps invariably deal with huge amount of personal and corporate data (in the case of enterprise applications). In such a scenario, it is of paramount importance to have a foolproof security solution which can take care of both mundane security issues as well as track dynamic runtime user behavior. There are a number of contemporary factors which make it all the more essential to adopt a robust and dynamic security solution. Device fragmentation arising out of multiple devices having outdated OS has been a long-standing issue. Sophisticated and intelligent malware attacks have been growing by the day. Companies adopt agile development cycles with continuous deployment and integration in response to security-related feedback. To handle all such complexities easily, RASP technology fits the bill. Runtime Application Self-Protection (RASP) is a security technology that employs runtime environment to detect and block the computer attacks by using information within the running software. RASP is linked to an application’s runtime environment to detect any threats and attacks in real time. This is done by analyzing both the network traffic as well as user behavior. This way, it is better to secure a device when compared to the traditional perimeter-based security solutions, like firewall, which only monitor network traffic without any contextual application. RASP acts at the application server layer and issues security alerts, blocks application execution at runtime, or even patches the application to shield it against further attacks. Since RASP resides as a part of the app’s source code, it is usually better equipped to deal with emergency situations. RASP analyzes app’s behavior and its context and validates data requests received from server directly without the need for a third party application. Since it resides on the server, the technology does not affect app’s design and helps in crafting responses adapted according to the situation. Developers have come to realize that adopting a proactive approach is an integral part of protecting applications. RASP’s defining security feature is to implement the security inside out, instead of following the traditional outside-in model. Self-protection and self-diagnostics feature without human intervention feature among basic implementation methods of RASP. It takes into consideration false positives also. It monitors application runtime behavior and identifies and stops attack vectors. This is done with zero latency. In this respect, RASP differs from the traditional Web Application Firewalls (WAF). This keeps RASP in good stead to take care of emerging threats also in application space and hence is a future-proof security solution compared to traditional solutions. RASP is compatible with a wide variety of applications, supports vast external libraries, and protects applications against a cross section of attacks, like SQLi, XSS, and CSRF. It mitigates vulnerabilities by neutralizing threats at runtime without the need to alter the source code. Hence, the underlying technology in RASP prevents the exploitation and breach to happen at the first place (proactive approach) rather than dealing with the aftermath of a security breach (reactive approach). What RASP provides is an extra layer of protection over and above what is provided by traditional approaches, like Static Application Security Testing (SAST), Dynamic Application Security Testing (DAST), Interactive Application Security Testing (IAST), and WAFs. This approach ensures that application is protected against leading security threats enlisted in OWASP Top 10 threats. Hence, RASP comes about as a life-saver for developers and businesses to respond in emergency situations in a quick and effective manner and insures applications by enforcing robust security standards and regulations. 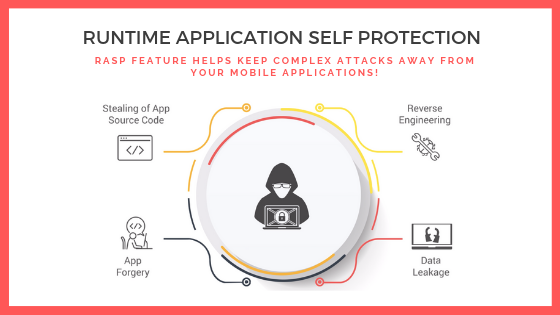 AppSealing’s solution with Runtime Application Self Protection (RASP) technology offers a dynamic approach to app security with a real time monitoring dashboard which tracks complex attacks and stops them from doing any damage to your application and brand reputation. Posted in AppSealing News and tagged android, ios, Mobile Application Security, rasp security, Runtime Application Self Protection.